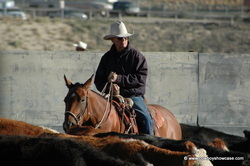 Jim Andrae, Tom Marvel and Rosita Marvel discussing their ranching history in Nevada. Moderated by Mike Laughlin. Video by Gail Steiger. Below are five links to an hour and a bit of oral history posted on YouTube. It is broken in four parts of 15 minutes or less. To hear the whole project please listen to all parts in sequence. Andrae- Marvel Oral History Part 2 Interesting discussion on horses and how long miles helped make them good, broke horses. At minute 7:12 there is a great quote about how fences ruined the cattle business. 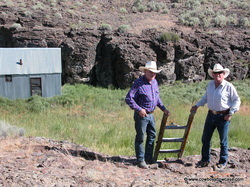 Jim Andrae and Mike Laughlin at the Devil's Corral, IL Ranch, Nevada.